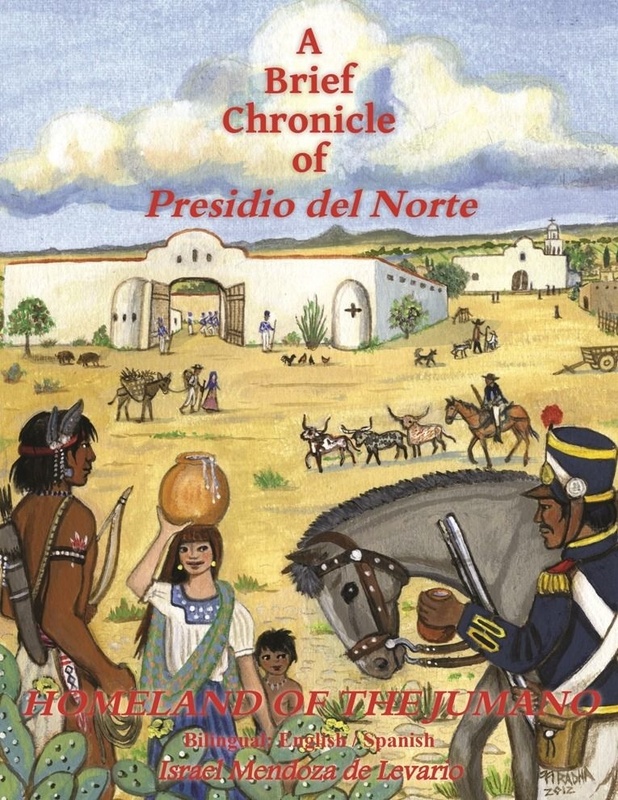 A Brief Chronicle of Presidio del Norte: Homeland of the Jumano is a book about the La Junta de los Rios region that became known as, Presidio del Norte which includes a large portion of West Texas as well as Northeastern Chihuahua and Northwestern Coahuila, Mexico. The book includes notations of an archaic Spanish document that was translated in 1936. It provides insight into the events and lives of people who lived in the region. The translated chronicle includes information from between 1775 and 1859 during the years surrounding Mexico's independence from Spain and when West Texas officially became a part of the rest of Texas and the United States. 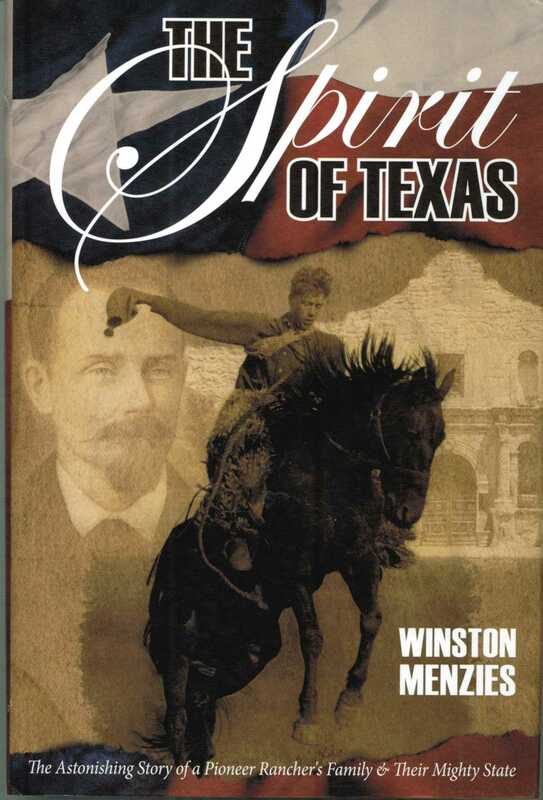 Very little is known about West Texas during these times, which alone makes this book historically significant. This preface, introduction and conclusion provide an additional history of the West Texas region that corresponds with the chronicle from the standpoint of its native populations. As such the book takes into account the native Jumano, Apache, Comanche and Mexican-American view of local and regional events as well as genealogical content. With the addition of local traditional knowledge an opportunity is presented to reevaluate existing facts and issues, to promote peace and understanding, as well as establish mutual respect and acknowledgment of all people. Israel Mendoza de Levario is a native of the La Junta region. His first publication was in 1996: Old Texas's Chile Cuisine. He was born in Pecos and, after the age of six, raised in Odessa, Texas. He is part of the last generation who grew-up with people born in the 1800's and early 1900's. As such, he learned about his past while literally and figuratively sitting on his grandmother's knee. Israel began investigating his family tree and ancestry in 1987, which expanded to include the history of the La Junta region (West Texas). An important part of his research involved interviewing elderly natives. In this regard, Israel is a person who was touched by the last generation of people who lived very much in the old ways and he has searched for answers that allow him to understand himself, his family, and the heritage of people in the La Junta region. role in and provided valued resources for the establishment of a new museum in Ojinaga, Chihuahua. Sources relevant to the rich and ancient history of the La Junta region are scattered and the history of the native people has generally been neglected, making it difficult for one person alone to gather all the information. Consequently, in 1989 Israel focused on establishing a museum with a research center in Presidio, Texas, but although deserving, the community at that time could not support such a project. not ready to support such a project, although Israel has not given up the vision of its establishment. During that period, Israel also played a role in developing relations, cultural exchange, economic and tourism expansion between Ojinaga and Chihuahua City government officials in Mexico with Olivia Wilson, Curator of the White Pool House Museum, businesses, and the former mayor Bill Hext of Odessa, Texas. 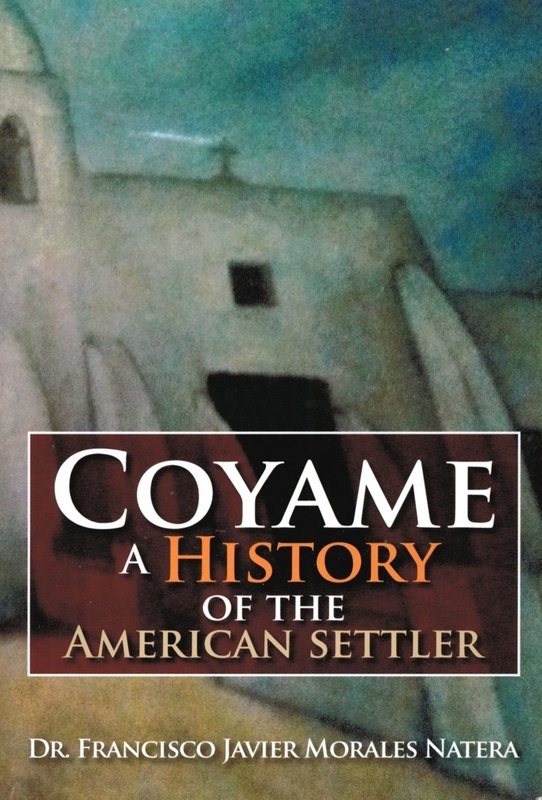 I just finished reading a new book; "Coyame A History Of The American Settler" by Dr. Francisco Javier Morales Natera. Although this is a first book for Dr. Morales who is an optometrist presently living in Andrews, it is a most interesting regional history and one that very much needed to be done. Morales was born in Chihuahua City and raised in Odessa. He traces family roots beginning in the tiny community of Coyame located a short distance west of the Texas-Mexican border in northern Chihuahua. The author spent more than a decade researching the history of the Coyame area and the fascinating past lived there by his ancestors. Morales offers his readers a refreshing view of history offered from the Mexican perspective. According to Morales, Coyame had human presence for thousands of years before the arrival of the Spanish. People were attracted to the place by fertile soil and a plentiful supply of water. The Mexican Conchos River flows just outside Coyame and pre-European natives used the river as a route to find their way through the rugged Chihuahuan Desert. In later times the Spanish also made use of this important Concho River route to the Rio Grande. Coyame has a rich and remarkable past and Dr. Morales has done a fine job of chronicling its story. Having said that I should also point out that the author's research efforts are somewhat diminished by his use of most unconventional references. Also, the book could have been much better had the author chosen to include an index. The book, ISBN 978-1-4797-3453-5, is available in hard and soft cover editions as well as a Kendel e-book. I've always enjoyed high quality history documentaries. However it seems in recent years such a thing is getting more and more difficult to find. Left wing agendas have pretty much taken over the National Geographic Channel and the History Channel is more likely to have stuff about UFOs or ghost hauntings than a decent history film. Happily the other day Arthur Soule got in touch with me to let me know about a new documentary he and Felix Mizioznikov have just released. It is titled "Ben Kilpatrick's Last Train Ride To Boothill" and is about a very real Texas outlaw and train robber. Benjamin Arnold Kilpatrick aka the "Tall Texan" was born in 1874 in Coleman County, Texas. His family moved to Concho County south of Paint Rock where they raised cattle and sheep and Ben learned to cowboy and ride before he left home, according to him at the age of twelve. Although he was generally well liked by some of those who knew him Ben became an outlaw robbing trains with Black Jack Ketchum's gang. 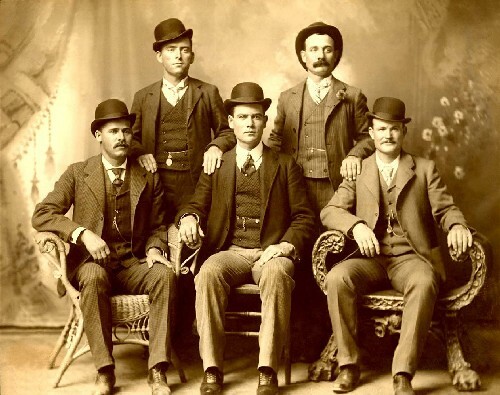 He rode for a time with Harry "Sundance Kid" Longabaugh and Robert "Butch Cassidy" Parker and posed for the famous photo of the "Wild Bunch" at Fort Worth in 1900. That's Ben seated in the center of the above photo with Butch seated to his right and Kid Curry seated far left. In 1901 Ben got arrested for participating in the robbery of the Great Northern Express train at Exter Creek, Montana. He spent ten years in prison for his crime and upon his release found the Concho County Sheriff outside the prison gates waiting to arrest him for the murder Oliver Thornton. The sheriff brought him back to Texas and he faced a murder trial that ended in a not guilty verdict. Apparently learning nothing from his time in prison and the trial, Kilpatrick went back to robbing trains with Ole Hobeck. It all ended badly in March 1912 when the pair tried to rob a Southern Pacific train outside Sanderson and got killed for their efforts. On April 29, 2012, a very special day will transpire! Special guests will travel short and long distances to be recognized while honoring our new Indian statue, "A Friend", and recognize the place on which he stands that has come to symbolize many things to a wide range of people. Come be a part of this historic Ballinger event that started 4 years ago with a dream from seventy-five sixth grade students and their teacher. Some of our special guests will include: Nell Shepperd Hambrick, 95, former Ballinger resident, teacher, friend, and daughter of Elmer Shepperd who originally purchased Ballinger"s original old Indian from Ardmore, OK. Donald Pearse and Geraldine Pearse Zuehlke, family members of the two men who built the old Indian rock base. These two men were William(Bill) Pearse and his son, Albert Pearse. Xoxi Nayapiltzin , our new Native American friend that is very appreciative of the students goal and has taken our mission to heart. He hopes that all Native Americans whose homelands are in Texas hear of this project to honor their ancestors and come join in the celebration. He is a dear friend to Fred and Kay Campbell, guardians of the pictographs in Paint Rock, Texas that so many people have enjoyed over the years. Xoxi's ancestors are of the Jumano family. However, he has chosen to coordinate multiple cultures of true Native American dancers, Elders, and Chiefs because of what our statue has always stood for, "A Friend". In Xoxi's own words, When the European's first came to this land, most Native Americans stood proudly to great them as a friend, just as your statue is doing and is how Texas got its name". We extend our invitation to all in helping us celebrate a "Dream turned Reality", a "GOAL COMPLETED" and the honoring of our Native Americans for their love, appreciation, and respect for this land and our country. All activities begin at 10 a.m. at the Ballinger City Park with the Glory Road Cowboy Church featuring the musical group,"Concho Valley Grass", followed by "Picnic in the Park" with various organizations offering lunch choices, and surrounded by fun booths for all ages. The Official ceremony will begin at 1:30 and will include several facets: the unveiling, recognition of our honored guests, followed by a celebration of the Native American Cultures and their descendants through dance and a very special ceremony of the "Blessing of the Ground" and a "Salute to the Four Directions". Come and enjoy a day of family fun and be a part of an event you will not soon forget! 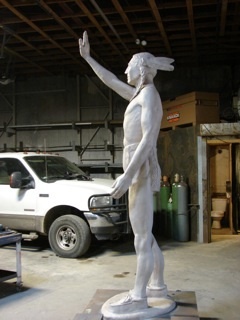 Two and a half years ago in May of 2011, after jumping off into the unknown with 75 sixth graders, a crazy notion of raising a large amount of money to purchase a ten foot tall new Indian, and the task of finding the perfect artist to bring the statue to life, WE DID IT!! My goal as the teacher was to at least have the 3 components of the project paid for BEFORE the Class of 2015 graduated from Ballinger Junior High. Indian--check, Park--check,check, Artist--check, check, check!! Task Complete! The major factors that brought about completion in May were the generosity of two contributors. The first contributor is Lynn Gregory of Gregory Custom Homes of Abilene, Texas with a donation of $3,500. Mr. Gregory is the builder that built our home here in Ballinger 6 years ago. Lynn is a very generous person as well as a very skilled contractor. He became a friend of the Carter family through the building of our home and the relationship continued after the last nail was hammered. He has now become a "Friend of a Friend" as well. The second and final factor that came to us literally with hours left in the school year and put us to the finish line was another $3,500 grant from the Dian Graves Owen Foundation also of Abilene. I just happened to be at Fiesta Texas in San Antonio on the Accelerated Reader Points trip with our BJHS students the day before we got out for summer break. I was about to get on a ride when my phone rang and it was from the Owens Foundation with whom I had been talking with for several days. The conversation ended with, "How about we help you close this project out with $3,500"! I couldn't believe it! We had just received the very LAST of the money for the original project with hours to spare! Being that it was the end of the school year and the sixth graders had become eighth graders and were about to move on to high school, we, the parents, had a celebration pool party for the kids. I had a "going away" package of goodies for the kids and one of the items was an Indian certificate that basically had the words "PAID IN FULL" on it. This was their first time finding out that we had finished a couple of days earlier. Needless to say, I, as well as the kids and parents, shed a few well deserved tears at the park that day! It was AMAZING to see the looks on their faces when they realized that we actually achieved our goal! We are we now? WE FINALLY HAVE AN INDIAN!! On January 25, Tammi Virden, Hugh Campbell, and myself traveled to Lubbock for our first look at our new bronze Friend to inspect, approve, and choose the final patina color finish. He is BEAUTIFUL! I wished that I could have taken the students with me, but there was just no way to take the number that would have wanted to travel to Lubbock and miss an entire day of school and activities. This day has been a long time coming! Since May, there have been multiple "snags" at the foundry in Lubbock which is the entity responsible for constructing our new Indian. However, as of February 3, I received that much anticipated email with a picture of the Indian now fully complete and his permanent color. I have included a picture of him in the sand-blasted bronze stage, but for the final look, you will just have to come to Dedication Day to see that! I have begun meeting with the Class of 2015 to prepare for the park renovation and plan our Dedication Day which has been designated for April 29 of the Ethnic Festival. My heart still skips a few beats when I allow myself to think of our dedication day and how incredible it will be to finally see our efforts come to completion and reality! Wow, what a journey! One last story to leave you with which was another one of those "WOW" moments we have had many times since starting this whole adventure. About two weeks before Thanksgiving, I received an email from a gentleman from Arkansas who wanted to inform me that his wife's cousin who lives in Tulsa, Oklahoma had one of the old Indians like we have at Higginbotham's Hardware store in Ballinger. I couldn't believe what I was reading! Another one??? AND...the gentleman said that the man in Tulsa wanted to give his to us to have for our collection. Needless to say I was thrilled at that news! However, fate would have it that he belong to another! A collector of Palacine Indian memorabilia found out about the statue and was able to purchase him before I was able to make contact with the man in Tulsa. But, as much as I would love to have been able to lay claim to TWO old Indians, the "one that got away" is now back home in Ardmore, a block away from the original main gas station where one used to stand and welcome customers. A loss for us, but a gain for that community that is just as thrilled to have their old Friend now back home with them as much as we are thrilled to have our old one welcome you in to Higginbotham's! Perspective??? One found his way home to Ballinger and now there is one back at home in Ardmore and all because a bunch of sixth graders and their teacher decided to shoot for the stars and try to achieve something that, at the time, was seemingly nothing but an impossible dream. In three months, IT BECOMES REALITY! 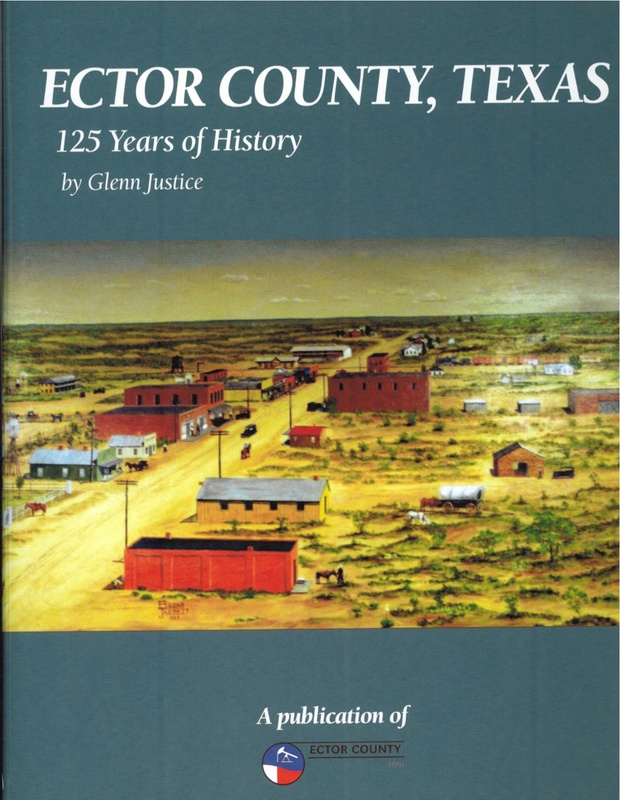 Historical Publishing Network of San Antonio has just gone to press with "Ector County, Texas: 125 Years of History" by Glenn Justice. The book is available at Cactus Book Shop in San Angelo see www.cactusbookshop.com and online at www.rimrockpress.com just in time for pre-Christmas delivery. Signed and personalized copies are available by request. The 192-page coffee table sized edition tells the story of Ector County from its earliest days with the July 1881 arrival of Texas and Pacific track construction crews at the site of the future city of Odessa. Known for a time as Milepost 296 somebody named the place Wells Point and a tiny track side tent city got its start. Wells Point became known as Odessa in 1885 when the community got its first post office. In 1891 Ector County became formally organized with the village of Odessa being named the county seat. Odessa existed a small cow town and rail shipping point until 1926 when Josh Cosden struck oil in the western part of the county. From that time until the end of the twentieth century Ector County oil wells have produced some two billion barrels of oil. Ector County, Texas: 125 Years of History chronicles Ector County's fascinating past with superb historic photographs. I owe a very special thanks to the book's photo editor Martha Edwards of Cinema Station in Odessa for her fine work researching, selecting and captioning the photos for the book. It is an exceptional collection of photos made by master photographers such as Jack Nolan and Bill Shoopman from the archives of the Permian Basin Petroleum Museum. Also, thank you so much to the many Ector County business folks whose support made this book possible. Also, thanks to Dr. Terry Shults at the University of Texas Permian Basin as well as Doris Baker at the Southwest History Department of the Ector County Library. ISBN# 9781935377580. Free shipping. Justice's hardback edition Ector County history book is $34.95 plus $3.06 Texas sales tax for a total 38.01. If you wish to pay by check make your check for 38.01 payable to Rimrock Press, 14339 Oak Ave., Millersview, Texas 76862. Remember to request any signed or personalized copies with your order. Working to get Papal for credit card or bankcard orders, the page at www.rimrockpress.com should have books online in just a few more days. Order online at www.rimrockpress.com or call telephone orders to 325-483-5406. The little foot bridge at Candelaria has been gone for some time now. Here is a very interesting Utube video update. Take a few minutes and check it out. 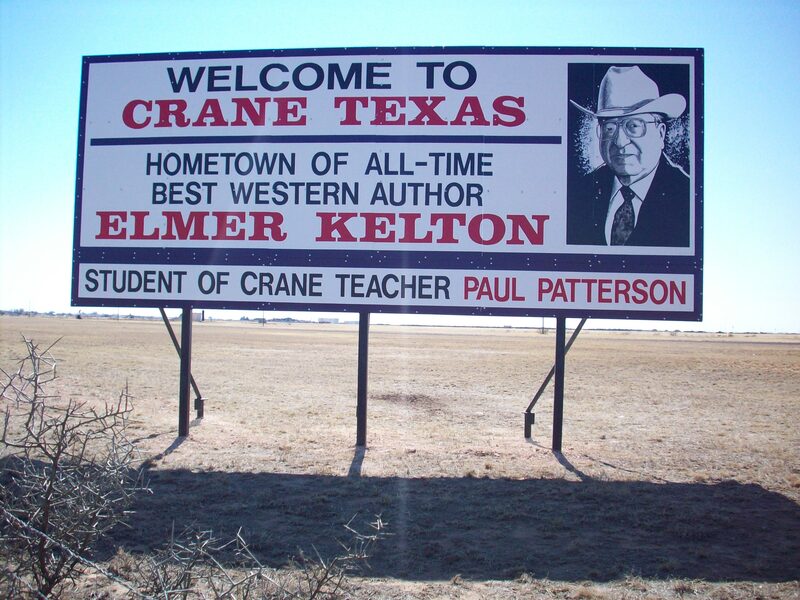 After publishing one of the last interviews given by Elmer Kelton in the December / January 2009 issue of American Cowboy, I realized that Kelton's former hometown of Crane, Texas, which is my hometown as well, had yet to truly honor the man whom the Western Writers of America branded the "All-Time Best Western Author." With this in mind, I approached the Crane Historical Society and Elmer Kelton. I proposed the idea for creating a large billboard sign to educate travelers heading south on Highway 385 that Crane does indeed have a famous son the best in his field, as a matter of fact! The Crane Historical Society loved the idea, and Kelton, humble as always, accepted the proposal, but with a couple of conditions: "Whatever you do with the sign, please make sure you put a cowboy hat on me to cover up this bald head, he said. Secondly, I would like ya'll to put on there that I was a student of Paul Patterson, because I never would have become a writer if not for that man! In the December / January 2009 issue of American Cowboy, I explored the relationship between Kelton and Patterson; the kinship the two shared as student and mentor. At the time of the interview, Patterson had just passed away and Kelton had a lot to say regarding his mentor's death. My questions to Kelton aimed at helping me understand the unique relationship that the two men shared, and Kelton choked up several times throughout the course of the interview. Little did I know then that the man grieving the loss of his friend would himself be gone from the face of the earth in just a few short months. After the idea was approved, the Crane Historical Society contacted Ray Ifera of Ray's Signs, in Crane, about creating the large billboard sign. Ifera quickly began work on the project, creating, in the end, a beautiful piece of artwork that dresses up the cleared desert background near the Crane County Airport. When I last spoke with Kelton, I informed him the project was in gear and would be completed in short time. As much of the news comes one's way nowadays, I found out about Kelton's death through a text message stating, I just thought you should know: Elmer died this morning. The message was from my uncle, a commissioner in Crane who knew the Kelton family. I had heard about Kelton's health issues from his own lips recently, and just like that he was gone. I was instantly blue in spirit; my feelings of his death mirroring, in a way, those Kelton had felt when Patterson passed. In many ways, I consider Kelton to have been my own writing mentor. And while we did not have the opportunity to grow our friendship more over time, I feel that in the time I knew him, we managed to share a great deal. Although Kelton did not survive to see the project reach completion, I sent him an email with photos of the sign and its beautiful artwork before it went up, and he promised to attend any ceremony in the future, if he felt up to traveling. He said he wasn't "feeling great these days." I could hear in his voice a weakness that was nearly absent in the prior conversations we had shared. He died on Aug. 22, 2009, at the age of 83. The song "Happy Trails" was played at his funeral. Kelton was a self-deprecating man, the type any person would be glad to know. He expressed a deep, humble thanks when he saw the photos of the sign. The world is a smaller place without him, and I regret that he didn't get to see the finished project. But, much like the great storytellers of old, Kelton will be remembered for all of the wonderful characters he created and developed within the pages of contemporary western literature. He was a great man, and people build monuments to great men. Perhaps a highway sign is a fitting memorial, and it's certainly a great way for the people of Crane to reach out and honor one of their best and brightest brothers, but people will surely remember Kelton not for a billboard but for the legendary cannon he left behind. His words are his legacy! RARE 1852 FRENCH MAP OF CHIHUAHUA: WHERE ARE PILARES AND PORVENIR? I love old maps and over the years have collected more than I can count. Old maps offer no small amount of little known information about people and places of the past. Sadly many old maps end up rotting away, their value as a historical research tool lost. My friend Charlie Angell is also an avid map collector. 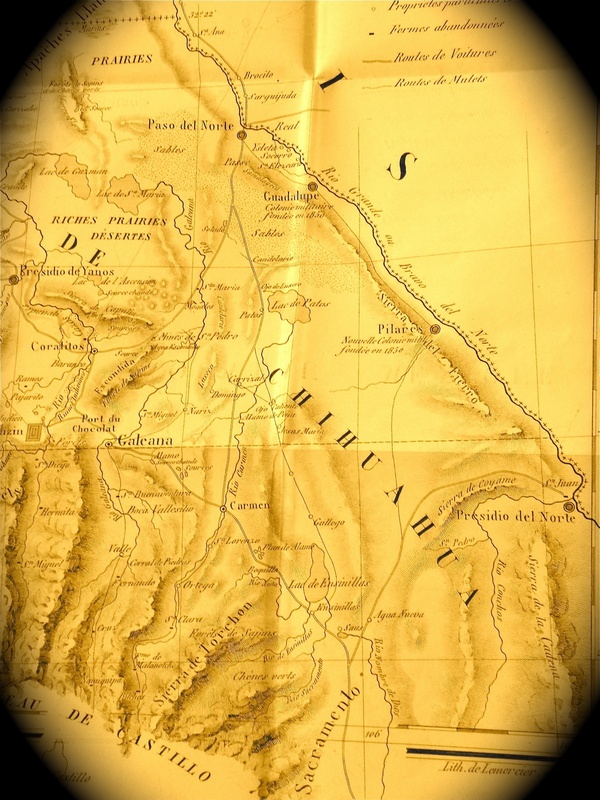 Sometime back, Charlie purchased a finely detailed 1850 map of Chihuahua by M. H. Du Pasquier De Dommartin. Despite its age, it is in pristine condition. 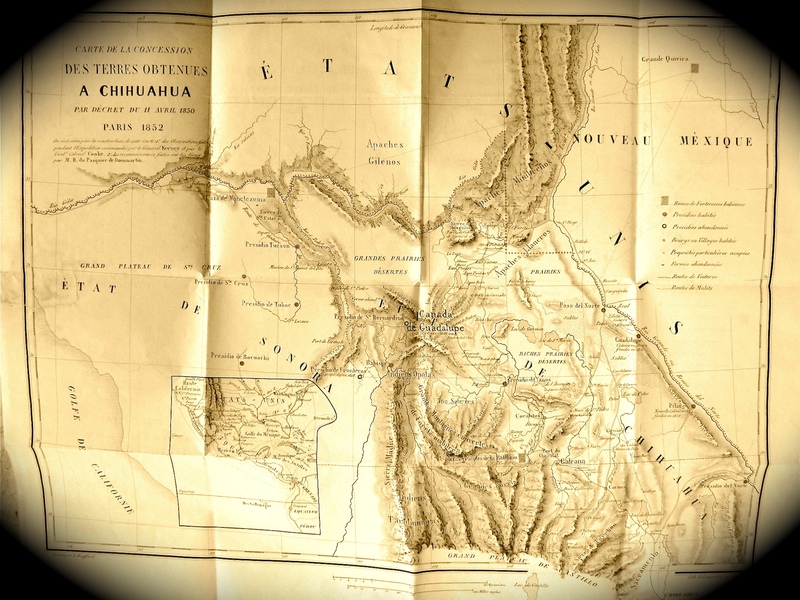 The map is in the French language, the title translating in English to "Map Of Land Grants Obtained In Chihuahua by Decree Of April 11, 1852". It notes the locations of abandoned and inhabited presidios and villages, military colonies, "Routes de Ventures" or Roads to ventures and "Routes de Mulets" or mule routes. It is a truly fine map, beautifully detailed even showing latitudes and longitudes, remarkable for its time. Not a lot is known about the map maker, De Dommartin, The Frenchman may have written a book, titled "The United States and Mexico, European Interest In North America" but as yet I have been unable to locate a copy anywhere but still looking. I found of particular interest the section of the map running along the Rio Grande from Paso del Norte to Presidio del Norte. In this section De Dommartin notes the locations of the 1850 occupied presidios along the Rio Grande including Guadalupe a short distance downriver from Paso del Norte. The Ysleta, Sorocco and San Elizario villages on the western banks of the Rio Grande are shown. This is a map of Chihuahua and does not extend to anything east of the Rio Grande in present day Texas. Guadalupe appears on the map with a symbol indicating it to be a military colony founded, according to De Dommartin, in 1850. Further downriver is Pilares noted to be on the map as being the location of the "Nonville Couonie" shown to be an occupied colony. Pilares, its location and history has long been confused with Porvenir, Texas. Pilares, Mexico lies on the western side of the Rio Grande in Chihuahua not far downriver from Porvenir on eastern side of the river. More than a few maps show, in error, the location of Pilares to be on the Texas side. According to the Handbook of Texas, Pilares was the site of a presidio, penal colony and silver ore smelter. While several other accounts confirm document this, the Handbook article places Pilares on the Texas side of the Rio Grande. The Handbook article notes a Spanish Viceroy designated Pilares to be a Presidio, penal colony and silver ore smelter in the 1750's. Both convicts and soldiers worked on farms at the colony. Although I have made several unsuccessful attempts to get this error corrected, the online Handbook continues to state that Pilares is in Texas. No houses or other structures stand at the site today. Only a few foundations mark the former locations of the adobes and jacales that the some 140 Mexican residents living there in 1918 called home. Porvenir had a school but no store, the closest mercantile being at either at the Brite Ranch or in Candelaria some thirty miles distant. Although many of the residents were U. S. citizens, a sizeable number had fled the Mexican Revolution from Chihuahua trying to find a more peaceful life along the river in Texas. Other Porvenir villagers, according to the 1910 U.S. Census were U. S. citizens. Several had recently moved to Porvenir from Pecos, Texas to farm cotton. About 1916, Hawkeye Townsend built a cotton gin at Porvenir utilizing old railroad timbers taken from the abandoned roadbed of the Rio Grande Northern Railway running from Chispa to the San Carlos Coal Company camp at Newman Springs. Today an extinct community, Porvenir had only short life as a farming village that existed on and off for only a few years. It first appeared in the early 1900's when good cotton prices and the fresh plentiful water of the Rio Grande offered the promise of better times. According to Fred I. Massengill in his "Texas Towns: Origin and Location of Each of the 2,148 Post Offices in Texas" Porvenir got its name from early settlers and the name origin is from Spanish meaning "land of plenty". Massengill does not list a Pilares, Texas in his 1936 book. Porvenir was a peaceful border farming community composed of adobes and jacales. Porvenir had a school. In January 1918, forty mounted U.S. cavalry troopers, some five Texas Rangers and an unknown number of ranchers surrounded Porvenir and after searching the place took fifteen men and boys out into the darkness and shot them to death. The next morning, the cavalry troopers burned most of Porvenir to the ground. The survivors of the massacre fled to Mexico and Porvenir, Texas was abandoned for a time. Charles Deaton's "Texas Postal History Handbook" lists Porvenir, Texas, Presidio County, as having a post office established in 1926. Also, it is known that a ranch school operated at Porvenir in the 1940's. It has been speculated that some of the confusion between Pilares and Porvenir started after the village was abandoned and someone took the postage cancellation stamp to Pilares where letters continued to be stamped as being from Porvenir, Texas.